The MultiGas™ Purity Analyzer is an FTIR Spectroscopy based gas analyzer capable of ppb contaminant detection in high purity bulk process gases such as NH3 (Ammonia), NF3, SiF4, and H2. 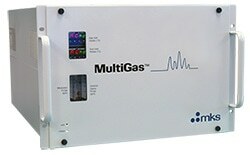 The MultiGas™ Purity Analyzer is composed of a process FTIR Spectrometer, high-optical-throughput internally polished sampling cell, and applications-specific gas analysis software. These integrated components, along with automated bake-out functionality, provide unmatched precision and accuracy for bulk gas contaminant monitoring. Specialized automatic zeroing and self-calibration software. H2O, CO, CO2, CH4, and NH3 in N2O.